[updated] Heard back from Siteworx with more implementation details. Signing a contract doesn’t necessarily grant you a seat at Tridion’s family dining table 😉 Getting fully tridionized, however, is a totally different story. Last week, yet another biggie joined the big (more than 500 customers) and happy Tridion family via a partner-led implementation. Mandarin Oriental Hotel Group can now properly enjoy the magical beauties of SDL Tridion Web CMS. The first Tridion baby delivered by Siteworx was the American Psychological Association with a total of 23 subsidiary Web sites — partially done, partially still in the worx with a goal of going live at the end of 2008. A total of Mandarin Oriental’s 26 (or was it 40?) Web sites were tridionized. Most of MO Web properties are managed from various, geo-dispersed locations and have different content. The underlying code was inherited. Some of it was recoded to enhance SEO. New AJAX features were added. The inherited design didn’t change much, aka no full redesign of the sites. Project length: about 6 (or 8 – Tim?) 8 months, originally was planned to be completed in 4-5 months. As with many other Tridion implementations — and Web CMS implementations in general — getting the content in place on time can be tricky. Close-to-heart understanding of Tridion and its functionality, limitations and capabilities is key. BluePrint design can be a toughie. BP with all its parent-child dependencies is also not the easiest thing to change, once the implementation has started. Rightfully so, CMS Watch in its 2009Web CMS Report notes that SDL Tridion PS started offering a “BluePrint and Security” workshop. BluePrint Design is also on the price list as one of the more sophisticated, creme de la creme PS offerings. As McLaughlin notes, Tridion can be very flexible with BP and workflow, as it can be complicated and not necessarily easy to get right the first time around — which is true with any CMS and honing its functionality into a good, workable solution. With the exceptionally unique Tridion BP, it may not be obvious as to how to use it best, and the the first take at it may not necessarily be the last one. Aside from the superb skills of Tridion Sales team, why did Mandarin Oriental choose Tridion CMS? Tridion’s BluePrint is clearly something very attractive to customers with a globalization flair. Managing global content, delivering that content across multiple channels in multiple languages, and protecting the integrity of a global brand is something Tridion CMS is defo a good fit for. SiteEdit is another way to enamor customers and they love it — especially, those falling into the category of non-techies. Siteworx plans to continue fine-tuning the MO implementation by adding new Tridion modules and stand-alone features like mobile-friendly gadgets. In Lieu of a P.S. [updated] The home page is assembled with a page template. Page is being published from Tridion and all assets for the page are managed in the Tridion CMS. Tridion id’s are not part of binary assets because they are removed at publish time to make it more SEO. Originally, 25 English site were migrated into the initial Tridion CMS implementation. Currently, there are 28 English plus 3 localized sites managed in the Tridion CMS. The original look and feel of the site did not change much. However, the html and css was rebuilt for SEO and 508 compliancy. Some sections were given a more updated look with the addition of some AJAX features. There’s also an official, press-released version of this announcement here and here. Quoting one of them (although, they’re identical): “We are proud that Mandarin Oriental Hotel Group decided to partner with SDL Tridion and Siteworx for its new global web presence,” said Erik Aeyelts Averink, president of SDL Tridion. I am proud, too, Erik. SDL Tridion Gearing Up to Open R&D Branch in the U.S.
At least, that’s what it looks like… Just came across several posts on various job sites about SDL Tridion looking to hire a Software Developer for its San Jose, CA, office. Pieter may come and go, but the show must go on. The new venture is positioned as part of the SDL Tridion Development Lab, headquartered in Amsterdam and supported by guys in Kiev, Ukraine. Awww, how very post-Soviet, makes me want to tear up 😉 Some things just never change. Our Development Lab is an international blend of ambitious software engineers who take pride in developing products that facilitate the business-critical processes of our customers. We create Content Management software for multinational business communication. We choose technology to match not just the problem at hand, but also the infrastructure requirements imposed by our customers. Currently, the San Jose office houses mostly SDL Tridion U.S. Professional Services staff, with R&D — it looks like — to come very soon. We do all of our software development using a Scrum process. This means that the team is largely self-organizing and, within a clear, small set of constraints, is left to optimize its own work. Scrum also means that every month, your product manager can expect to see new product functionality that adds value to our customers. SDL Tridion’s R&D presence in the heart of the self-proclaimed capital of Silicon Valley surely seems like a logical progression of the company’s U.S. expansion. The question is who will lead the effort? Clearly, there will be someone magical to take on the R&D effort a la Californie. Yup, no more Pieter at Burgemeester Stramanweg 101( and, since 4 months ago, Hoogoorddreef 60) in the outskirts of Amsterdam. No more lounging in the funky orange trademark swoosh chairs while drinking crappy coffee from coffee machines available on almost every floor, or sitting in the boardroom, or going on dog sled runs in Sweden as part of Tridion’s annual employee-only fun events, or visiting the Sodexo-inspired cantina on the second (Was it the 2nd? Can’t quite remember) floor. I wonder why… Things been going quite well, new offices opened up in the US, Europe and Japan. Licensing revenue has been good. He must’ve just gotten tired. 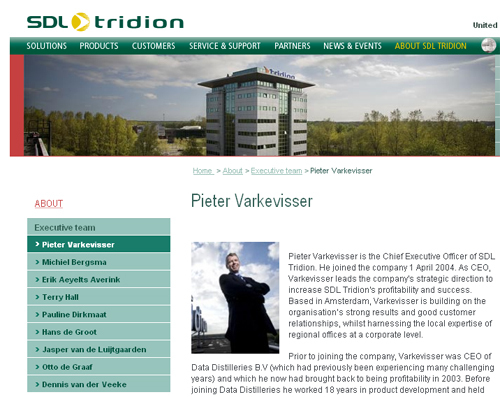 Varkevisser has been the CEO for over 4 years, and it doesn’t really come as a surprise that he’s leaving not long after Tridion was acquired by SDL for €69 million. Who knows how much Pieter got from that deal. Still, it would be interesting to see (if) where and when Varkevisser re-emerges. Kolleman said: “I’m delighted to be joining SDL Tridion at such an exciting time. I look forward to continuing the growth of the company through expanding our operations worldwide and making strategic acquisitions.” Who wouldn’t be delighted? Kolleman comes to SDL Tridion from Exact Software, where he held a number of senior positions in general management. His last position was Managing Director of the largest operating company of Exact Software, a software company headquartered in the Netherlands with revenues over US$ 350 million. 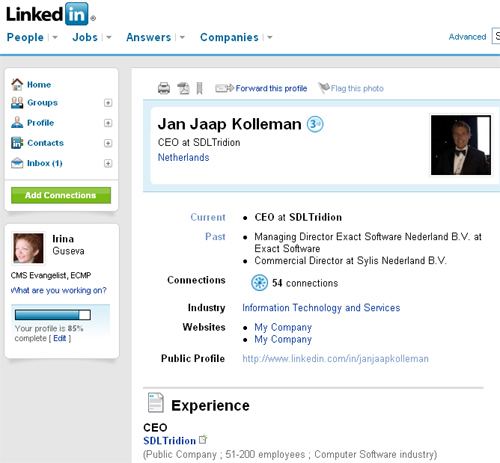 Prior to Exact Software, Kolleman was commercial director at Sylis Netherlands, a full provider of IT services. The funny thing is Kolleman has updated his LinkedIn profile, before SDL Tridion’s web site was updated to reflect the change. What’s not funny is that he only has 54 connections. Seriously, 54. Even Pieter has 187. Surely, Tridion in the U.S. will not suffer. While the U.S. economy is the worst it’s been since the late 1990’s (I call it the Great Depression – Part Deux), folks need WCM and Tridion is there to provide the tools. Straker, with its ShadoCMS v8.5 Web CMS, and Across Systems’ Language Server teamed up to deliver a new localization interface, providing an automated process from web content creation to translation management, publishing and handling of dynamic multilingual content. Better late than never, as they say. So, welcome to the global content management party!